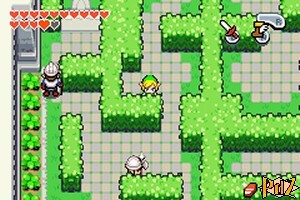 After the message from King Gustaf, go back to Hyrule Town, cross the North Hyrule Field and get in the Castle Garden. The left part of the garden is watched over by guards. Use the hedges to hide and go through the garden to the north. Go down the ladder to reach the underground level of the castle and head north to come back to the sanctuary. Thrust the sword into the pedestal to now be able to create two clones! Do this on the bottom slabs to walk on the switches and get out. Leave the castle from the garden, then go straight ahead southwest. Go down the ladder, then create two clones on the slabs to be able to push the big block. Climb the ladder, then the stairs and go west. Light your Lantern to see your surroundings, then go down the steps. Drop a bomb between the poles, then get into the cave. Accept to speak with the Great Fairy, then correctly answer her questions to get a bigger quiver. Go on southwest, then go north. Read the sign, walk towards the indicated direction, then read the next signs and follow the indications to leave the maze (up left left up right up). Then, go north and west to find a house (the lantern is no longer required). Get in, talk to Dampé and receive the Graveyard Key. Get out and... grrr... talk to Dampé right on the left, then look for the crow sitting atop one of the graveyard trees. When you found it, put on your Pegasus Boots and run into the tree to make it drop the key, then quickly take it back. Speak to Dampé again so he opens the gate and go on. Go ahead, push the tombstone right in front of you, then go right and break the blocks to discover some slabs. Create two clones, then walk on the pushed tomb to walk on the three switches a little higher. Go underneath the tombstone. Get rid of the two Gibdos to get a Small Key and five bombs, then go up. Pull the left toadstool to go across, and go past the three doors to find out that only the middle one is real. Open this door, then go right. Create two clones on the slabs, then go up to walk on the switches and pick up a Small Key. Then go to the other side and create two clones when the platform is down. 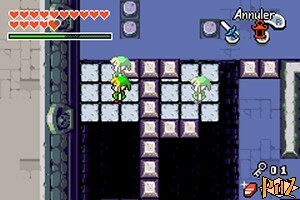 Climb on the platform while avoiding the blocks and walk on the switches to get another Small Key. Go in the middle, unlock the two blocks and go north. Go through the corridor, light the four torches, then fight another two Gibdos. Then go north to meet the spirit of King Gustaf. He will entrust you a Golden Kinstone and give you a clue to go on your quest. Leave the Royal Valley, go northeast of North Hyrule Field and go on east. Get on the bridge to the north and fuse your Kinstone with the Source of the Flow. Get in the cave, go to the next room and get out. Climb along the wall and take a look at the stele to reveal another Wind Symbol. Get in the northern cave, then take the stairs on the right and get out from the right. Climb along the wall, then go west and walk into the tornado. Speak to Hailey, the weird character, then go on right and talk to Gale. Get into the red whirlpool, then go east and get a Golden Kinstone from the chest. Jump into the hole at the top, get into the next whirlpool, then dig the snow to get a Kinstone. Jump into the hole and fuse the Kinstones with the Mysterious Cloud. Go back up, jump into the tornado and fly west. 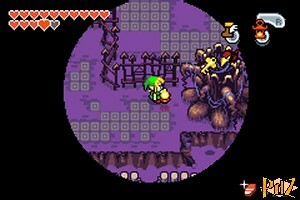 Jump into the hole, then get rid of the two enemies to get another Golden Kinstone. Go back up thanks to the whirlpool, dig the snow, then jump into the left tornado. Fly west and open the chest to get a Golden Kinstone. 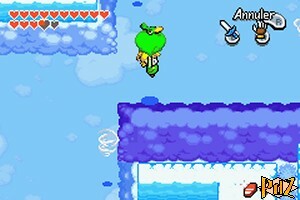 Dig the snow (there are two chests above containing 50 mysterious shells), then jump into the tornado, fly towards the southern one and fly southwest. Jump into the hole, get rid of the enemy with the Cane of Pacci and fuse a Kinstone with the Mysterious Cloud. Go back up thanks to the whirlpool, then go on to the southwest. 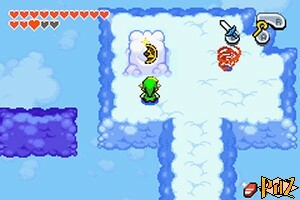 Pick up 50 mysterious shells from the chest surrounded by snow, then jump into the hole. Use the Cane of Pacci to get rid of the northern enemy and fuse another Kinstone with the weird cloud. Go back up from the right, find a Kinstone in the snow and open the chest to get a Golden Kinstone. Jump into the hole, come back down and go back up thanks to the whirlpool on the right. Jump into the next hole and get rid of the enemies to pick up a Golden Kinstone. Go back up right next to it, pick up 50 mysterious shells form the chest and jump into the bottom tornado. Fly southeast, find a Kinstone in the snow and jump into the small hole. Go back up, find a Kinstone in the snow and jump into the northern hole. Fuse the Kinstone with the Mysterious Cloud, go back up, jump into the next tornado, fly northwest and land to the west. Dig the snow, jump into the tornado and fly to the west to reach the right side of the last place. Jump into the hole and perform the last fusing with the Mysterious Cloud. Get into the big tornado. Look at the stele to add a Wind Symbol, then get in the beautiful house. Talk to the members of the Wind Tribe, then go to the fourth floor and talk to the grandmother. Get out, talk to the little girl and climb on the roof. Go north, break the pots to find a small fairy and get into the next temple.